Mega Fortune was created with the sole purpose to thrill various slot enthusiasts in the online gaming industry. Found in the game title, it delivers on the promise as every single characteristic of the slot game gives you a taste of living the high life. Mega Fortune was created and developed by Net Entertainment and is presented on 5 glorious reels with three rows and 25 pay lines. This unique slot game also provides several opportunities to increase your wealth with a magnitude of bonus features including wild symbols, scatter symbols, multipliers, a free spin feature, three progressive jackpots and a top jackpot bonus worth 1,000 coins up for grabs in the base game. In the beginning of 2013, the Mega Fortune video slot made history after a progressive jackpot of £17.8 million was claimed by an online slot enthusiast. This colossal jackpot amount was able to set a new world record in the online gaming industry, and therefore the overjoyed slots winner managed to make an entry into the Guinness Book of Records. This is the perfect opportunity for you to set the reels in motion on this incredible video slot where you stand a chance to walk away with a lucrative amount and live it up like a true millionaire. As soon as you open the game, you will feel like you’re in the money with all the glittering diamonds and gold encrusted features spread across the screen. Mega Fortune is aimed to only provide the finer things in life, and you will notice the entire theme is set around this idea. The background takes place in a high-class Hollywood-style location where you will see a beautiful silhouette of the city skyline in the distance, illuminated with several spotlights behind the reels. Furthermore, you have a gorgeous and expensive yacht on the left-hand side of the reels while each pay line number has been presented in individual diamonds. Even the spin button is decorated with diamond encrusted gold to showcase the high life. The background music is a disco-styled soundtrack from the 1970’s and continuously plays for the duration of your stay. If you manage to hit a winning combination, the music will even escalate to promote your win. The lower valued symbols are presented with silver, and gold gemstone rings that feature J, Q, K and Ace imbedded on top of a stone. The lower valued symbols are worth between 75 and 150 coins when five trigger respectively. The higher valued symbols include a luxurious pearl white limousine paying the highest bonus of 1,000 coins, a thick stack of dollar bills that are held together by a gold money clip encrusted with diamonds paying the second highest bonus, an expensive gold and diamond watch and a brandy snifter and cigar complete the various symbols found. The Mega Fortune video slot can be enjoyed for fun or for real money. Before you start the journey to wealth and fame, you will first need to set your desired betting options to suit your playing style. You can adjust between 25 pay lines stretching across the reels, but the more lines you have activated, the greater your chances will be of increasing your bankroll. Mega Fortune has four different betting levels where you can bet up to 4 coins per pay line, and you will be able to choose from coin denominations ranging from £0.01 to £0.50. The minimum bet you can place on a single spin starts at £0.01 while the maximum bet per spin is £50.00, making Mega Fortune one of the most affordable slot games in the Net Entertainment portfolio. Mega Fortune also comes packed with exciting additional features. You can completely switch off the background music and sound effects, change the quality of the game’s graphics and view your betting history. There’s also an Auto Play feature where you can set the reels to spin automatically and utilise the Skill Stop feature, stopping the reels in mid-spin to create a winning combination. The Yacht icon acts as the wild symbol and will stand in for all other standard symbols except the scatter symbol and bonus symbol. You will also stand a chance to win 10,000 coins when you manage to display five Yacht wild symbols on an active pay line. The two goblets and bottle of champagne represent the scatter symbol, and if you can display two, three, four, or five champagne symbols anywhere in view, you will be awarded 2x, 3x, 10x, or 100x your total bet amount respectively. If you can display a minimum of three Champagne scatter symbols, you will active the free spins round. 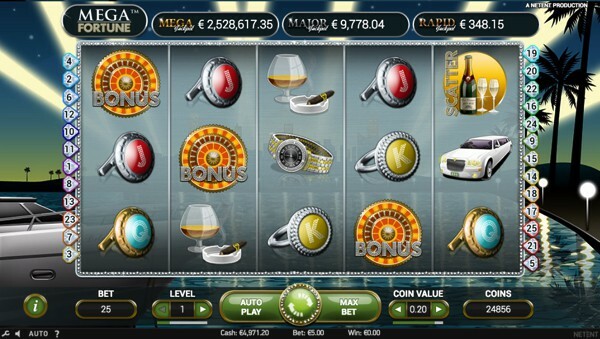 Upon being activated, you need to pick one of the champagne bottles on screen to reveal the number of free spins won. The free spin feature can also be re-triggered if you manage to display a further two or more Champagne scatter symbols. This can award a multiplier or additional free spins. The Mega Fortune Wheel acts as the bonus symbol and to activate the bonus game you will need to land a minimum of three bonus symbols on an active pay line left to right. As soon as the bonus game is activated, you will be taken to another room where a massive wheel of fortune will be displayed consisting of three sets of circles. The first outer circle will spin automatically, and if you are lucky enough to land on an arrow, you will activate the second circle. If the second circle stops on another arrow, the last circle will spin for an opportunity at one of the three progressive jackpots including Rapid Progressive Jackpot, Major Progressive Jackpot and Mega Progressive Jackpot. Even if you don’t land on an arrow, you will stalk walk away with a cash prize by displaying a number on the wheel of fortune. Mega Fortune video slot, designed by Net Entertainment, is considered one of the most popular games in the online gaming industry. The game features a medium variance and a Return to Player ratio of 96.60%, making this a rather lucrative slot game with frequent pay outs if you have a little luck and patience on your side.